Dressing up as a favorite superhero, princess or villain while collecting a cascade of candy from friendly neighbors? It’s a kid’s dream. 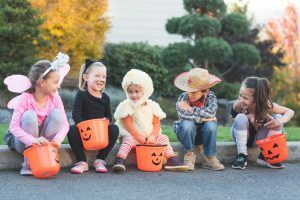 The United States Census Bureau estimates that more than 41 million children age 5-14 go trick-or-treating across the nation (as of 2015). 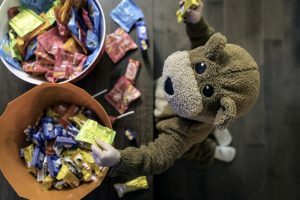 If you plan to participate in the Halloween festivities, be mindful and attentive, especially when it comes to candy, to ensure you have a great time while staying safe. When you return home from trick-or-treating, your child is probably eager to dump out their haul and take inventory. However, you should visually inspect everything before they eat it. Give them one positively safe treat from their stash to enjoy while you do this. Also, never allow your child to eat homemade treats unless you got it from a close friend or family member. For small kiddos, remove all hard and chewy candies, nuts, gum or small toys that could become a choking hazard. Be mindful of caramel, chewing gum and other sticky treats if your child has braces or a retainer. When it comes down to it, if you are unsure if the candy is safe or not, throw it out. It is helpful to feed your children a light meal or snack before you start trick-or-treating. This keeps them full so they’re less likely to snack on candy while out and about. At the same time, encourage them to wait until you get home and have had a chance to inspect their candy before they eat any. Keep an eye on how much your child eats in one sitting. Despite being labeled “fun-sized,” small candy is deceptive in that it contains an abundance of calories, which adds up quickly. Be careful of certain specific candies, such as black licorice. The FDA reports that consuming too much could cause abnormal heartbeats or arrhythmias, especially in older adults. This is caused by a compound in the licorice called glycyrrhizin, which lowers your potassium levels. To avoid this, don’t eat too much black licorice in one sitting. Along with that, candy that contains sorbitol, which is a low-calorie sweetener sometimes used in place of sugar, can cause diarrhea or other gastrointestinal issues. Consuming 10 grams or more could give you symptoms ranging from mild gas to cramps and severe diarrhea. Children may be affected by smaller amounts. You should also be watchful when your children play with glowsticks. Should they break, it’s possible for your child to ingest some of the liquid inside. While it has minimal toxicity, ingestion can cause irritation or vomiting. Contact with skin or eyes could also cause irritation. If your child ingests glowstick liquid, call Poison Control at 1-800-222-1222. 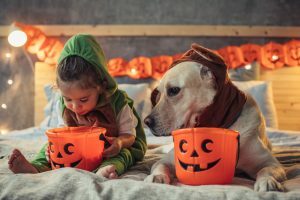 The American Society for Prevent of Cruelty to Animals (ASPCA) reports that the week of Halloween sees an abundance of calls to veterinarians and animal poison control centers, so it’s important to be diligent in protecting your furry friend. Candy can be deadly for your cat or dog, especially if it is sugar-free or contains raisins or chocolate, which can cause seizures or organ failure. When children dump out their bucket to take inventory of their candy haul, it’s all too easy for your pet to sneak a snack. Make sure they’re in another room or carefully supervised. Also, keep an eye on costumes and Halloween decorations. There’s a chance your pet could ingest items that become choking hazards—such as glowsticks, wrappers or lollipop sticks—or be burned by a jack-o’-lantern candle. If pets do get hold of candy or suffer a burn, call your vet immediately. Have a safe and fun holiday. Happy Halloween!